It’s true what they say, people—especially consumers—rely on striking visuals in order to get our attention. Businesses everywhere have been well aware of how consumers operate, which is why there is such a thing as branding and business signage. The problem is that signs are everywhere. There are street signs, billboards, building signs, posters, electrical signs, restaurant signs, address signs, and even signs advertising for signs. And then to make matters more challenging, businesses are aware of the saturation of signs, so their method of competition is to make a custom sign that’s bright, bold, big, and anything from basic. Don’t get us wrong, we are not opposed to beautiful custom signage, but sometimes businesses get a bit carried away and end up deterring the public rather than enticing them. At Signs By Van, we are the go-to custom sign company in Salinas and throughout Monterey County. We have had the privilege of servicing wineries, small businesses, restaurants, and other clients spread throughout California to not only build custom signs, but establish an eye-catching brand and design. Over that past 30 years, we have mastered the craft of fabricating custom business signs and installation, in addition to branding companies. It’s safe to say we have learned a thing or two about the industry, and can say that artistically modest signs make a big impact on consumers. If you’re searching for to rebrand your business and give it an updated facelift, you’ve come to the right place. In today’s article, we’ll go over why perfectly understated signs are beneficial to helping your business grow. Your business sign’s main purpose is to drive potential customers to you. 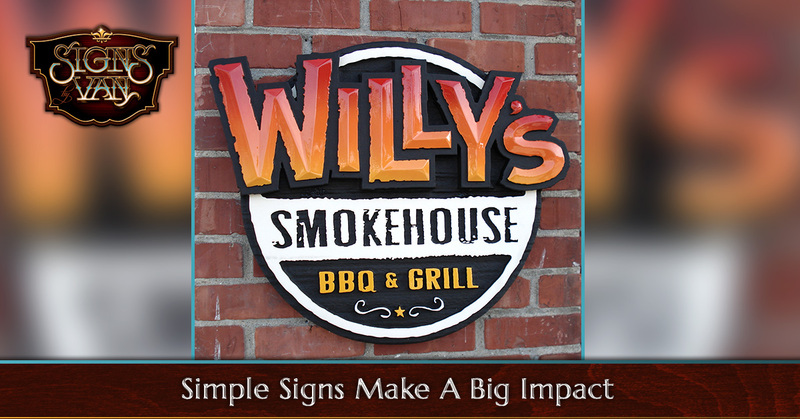 So it is critical to have a sign that best represents you, your brand, message, and business. Many business owners will feel inclined put everything their company offers all in one sign. But when a client requests their sign to include their business name, motto, logo, every single service itemized with prices, address, business hours, phone number, and year established—it gets to be a bit much. Not for us, but as a consumer it’s hard to take in all of that information, especially when you’re passing by. The key to making a lasting impression on customers is a well-made sign that intrigues people through the design itself. When someone notices a captivating business sign, they’re more likely to remember the name and look up the business online or simply walk in the door. Saving money is good! But making money is even better. A well-designed and perfectly modest business sign can do both. A sign that features every bit of detail of your business needs space for it to go, which means you would need to purchase a larger sign, which requires more materials, and labor, costing you more money up front. A quality sign that is made by a professional designer and sign maker will work with you to find the best solution for your brand that will attract more customers with less information and most likely for less money. Why go through the trouble of creating a business sign that nobody reads? Even if you decide to include more information, a modest sign with a decent amount of content is much easier to read, especially as people pass by. Let’s think about it this way: if you are hiring an individual or company to manage your personal finances, like an accountant, you expect them to be organized and professional. If their business sign is outdated, cluttered with too much information, and poorly designed, you would be hard pressed to not pass judgement and overlook them. That old saying, “don’t judge a book by its cover” is true, in certain situations. There are so many companies that are competing for customer’s business, their only shot at winning them over quickly, and a neat and clean storefront sign will win over more customers. Overall, your custom sign is yours, and only you know how to best represent your business. But when you hire Signs By Van to design a custom business sign for your storefront, our team will design a sign that best represents your business. Visit our portfolio and contact us to set up a consultation today!